Features -- Guangzhou -- 7 August 2018. Survey by Dee Siu. A spectacular cycling boom in Guangzhou instigated by dockless bike sharing has just as quickly fizzled out. The ban on new bike sharing bikes being introduced to the city have drastically curtailed the appeal of the dockless systems, and the large influx of new cyclists were also deterred by the lack of any on-road measures to support cyclists. The situation could just as rapidly change again if a more pro-bicycle stance is taken by the City. 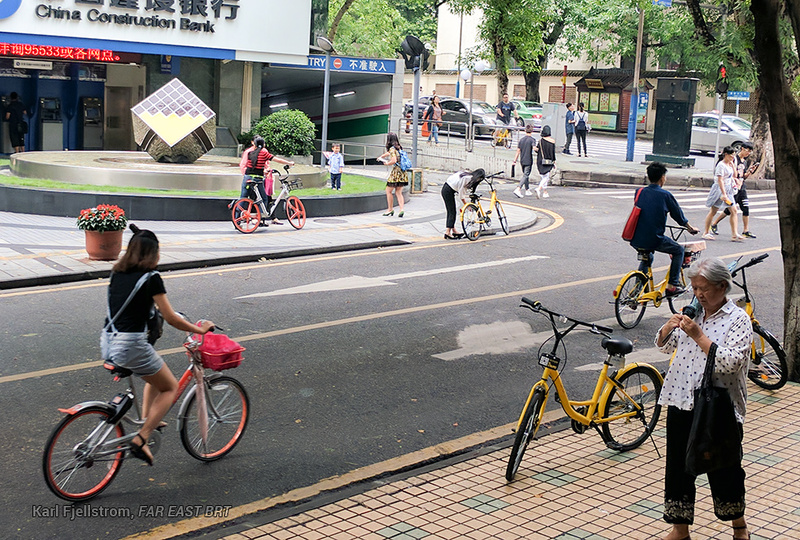 Dockless bike sharing, introduced in Guangzhou in July 2016, led to a doubling in cycling in a year, and provided an excellent opportunity for the city to introduce policy and infrastructure measures to support the sudden influx of new cyclists. Unfortunately, as seen in so many other cities in China and worldwide, rather than grasp the opportunity to entrench and build upon the dramatic increase in share of trips taken by bike, the city instead focused on bike sharing restrictions and did not implement any infrastructure measures to enable more convenient travel by the new cyclists. 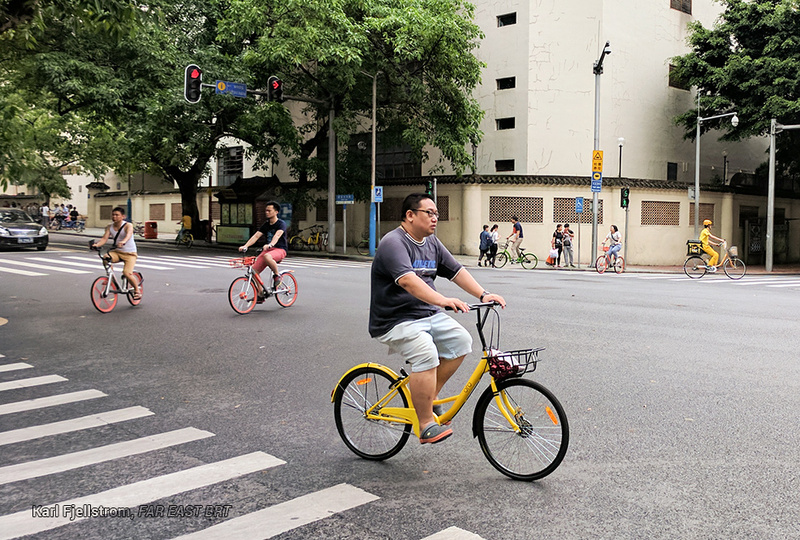 As a result, the sudden reversal of years of gradual decline in cycling in Guangzhou brought on by Mobike and other dockless bike sharing systems has been just as suddenly been rolled back, with cycling plunging to levels even lower than before the dockless bike sharing boom first appeared. Based on these counts cycling in Guangzhou, rather than experiencing a renaissance, is now at its lowest level in decades. Mobike and the other main dockless bike sharing systems in 2017 rapidly supplanted the traditional bike sharing system based on docks and stations, and by August 2017 accounted for more than half of all peak hour cycling trips along the BRT corridor at the two survey locations of Huajing Xincheng and Tangxia. But by August 2018 bike sharing acccounted for only a quarter of all cycling trips at Tangxia. At Haujing Xincheng the number of bike trips fell five-fold, from 3,211 per hour in August 2017 to only 605 per hour in August 2018. The number of trips by bike at Huajing Xincheng, which had doubled between August 2014 and August 2017, have by August 2018 plunged to levels much lower than in 2014. The 'cool' factor has been lost as Guangzhou has banned any new bike sharing bikes in the city since August 2017. The remaining bikes are increasingly dilapidated and under-used. Far East Mobility carried out counts of bikes passing two points along the BRT corridor, in the morning from 8:18-9:18AM near the Huajing Xincheng BRT station, and in the evening from 5:05-6:35PM near the Tangxia BRT station. Both counts were on the north side of the road and covered bikes going in both directions along the BRT corridor. The counts were held at exactly the same time and location as counts done in August 2014, for comparative purposes. The results indicated a significant increase in cycling between August 2014 and August 2017, with the new dockless bike sharing systems producing a large overall increase in cycling numbers, by 100% in Huajing Xincheng and by 50% in Tangxia. The traditional dock-based bike sharing system was abandoned by users, despite being free for the first hour, and by August 2018 has been completely removed. However, by August 2018 cycling had drastically declined to less than half of the August 2014 level at Huajing Xincheng, and around the same level as August 2014 in Tangxia. By not allowing any new bikes, the city has ensured that the bike sharing fleet has become far less attractive to users. E-bikes, though formally banned in Guangzhou are being increasingly allowed to operate, and now account for 27% of cycling trips at Huajing Xincheng and 61% of cycling trips at Tangxia, and are included in the cycling trip numbers reported from the surveys. With a doubling of bike trips due entirely to the new dockless bike sharing systems, local authorities and road designers had an opportunity to provide much better bike facilities in the form of continuous bike lanes, bike-friendly intersection design and operation, improved greenway networks, and reduced conflicts between bikes and buses at bus stops. Hopes that the rapid uptake of the new bike sharing systems during 2016-2017 would prompt supporting policy and infrastructure measures have, however, been dashed. Instead, the city focused on measures to contain and restrict the new dockless bike sharing system, including a ban on new bike sharing bikes in August 2017 and tight restrictions on where the bikes could be parked in March 2017. The ban on new bike sharing bikes being introduced has been especially damaging to the usage of the new systems. Most of the bikes are not designed to last more than about two years in regular operation, especially noting the hot and humid summers in Guangzhou. The Mobike bikes are more robust than other brands, but still require regular replacement of older bikes and infusion of newer bikes and models. By not allowing any new bikes, the city has ensured that the bike sharing fleet has become far less attractive to users, with older models and damaged bikes not upgraded or replaced by newer models and bikes. The inevitable industry consolidation has occurred. Since the surveys in August 2017, Bluegogo, Xiaomin Danche and other systems are no longer operating, with Mobike and Ofo now the main operators. Mobike has been procured by a food delivery company, and Ofo is rapidly contracting operations in a search for profitability. While Ofo's breakneck oversaturation of substandard bicycles was never going to work, Mobike's higher quality (but similarly priced) offerings deserves much stronger support from policy-makers. Of course it is not too late for Guangzhou to reverse course and provide the policy and infrastructure support needed to encourage more cycling, led by dockless bike share system usage. The doubling of cycling trips in Guangzhou between 2016 and 2017 shows pent up demand for short trips by bike. Anecdotally Far East Mobility's experience, which is backed up by the survey data, is that many people tried cycling with the new dockless systems, but stopped due to combination of ant-bike share policies, a bike share fleet in increasing disrepair, and the lack of dedicated bike lanes. Location of counts carried out in August 2014, February 2017, August 2017 and August 2018. Bike-bus conflict at bus stops along Zhongshan Road in Guangzhou in July 2017. 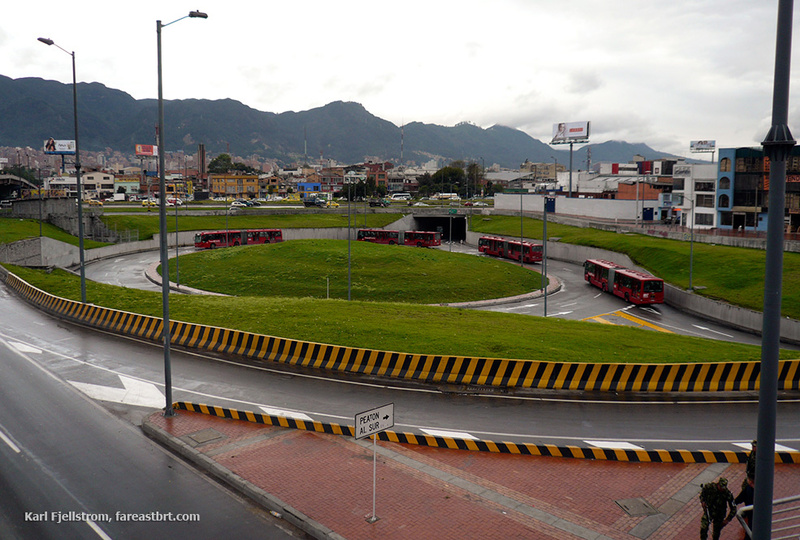 Design measures, including median-aligned BRT or bus lanes, are needed to solve this problem of bike-bus conflict at bus stops. Typical scenes throughout Guangzhou in 2017. Most cyclists were using the new dockless bike sharing models, but bike facilities were not improved, and cycling has precipitously declined.